The E36 is Eureka's compact walk-behind scrubber-dryer, ideal for the thorough cleaning of small, confined spaces you couldn’t scrub before. It's suitable for areas ranging between 200 m² and 1000 m². 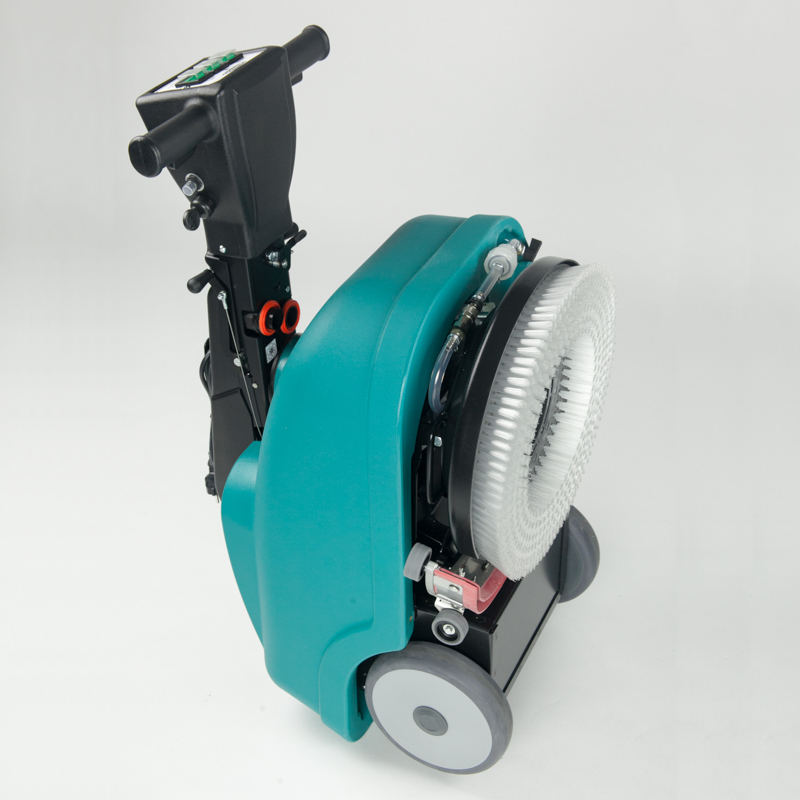 WHY IS THE E36 WALK BEHIND SCRUBBER-DRYER SUITABLE FOR EVERYBODY? The E36 is compact, highly maneuverable & it has very intuitive controls. 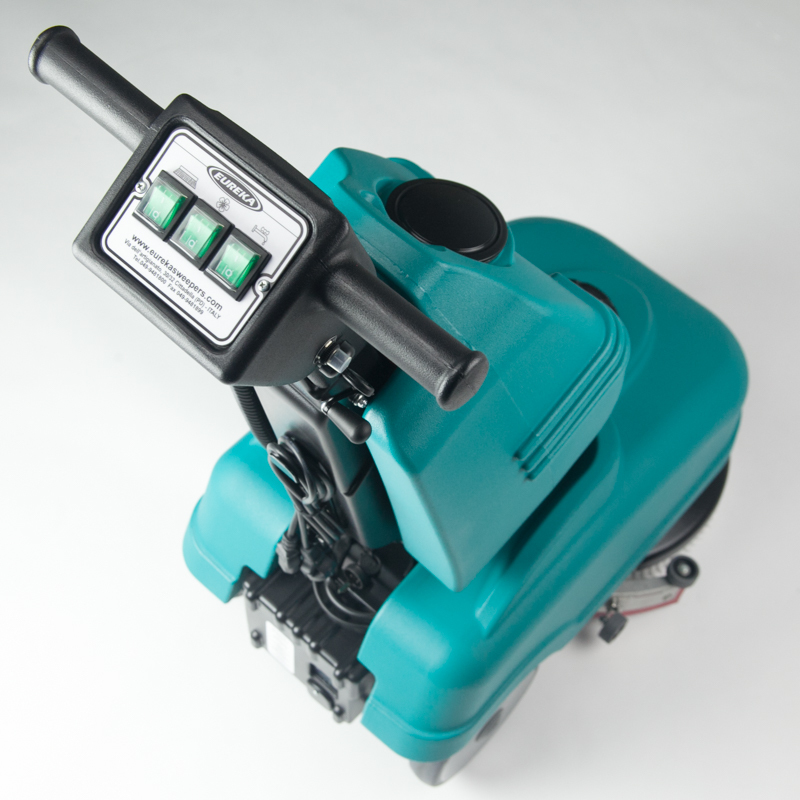 Consequently, cleaning all surfaces with E36 scrubber-dryer is quick, efficient and easy. Moreover, the machine can be simply folded for practical transportation and storage. WHICH MODELS ARE AVAILABLE FOR THE E36 SCRUBBER-DRYER? ? The machine is available either driven by a 12 volt sealed battery, which allows for an impressive 1 hour 40 minutes of continuous operation, or cord powered for unlimited running time. WHICH IS THE BEST ONE? THE E36 BATTERY OR CORD POWERED VERSION? It depends only on your specific needs: the E36 battery powered version (E36B) is ideal for cleaning small narrow areas, while the E36 cord powered version (E36C) offers unlimited running time. Eureka S.p.A has specially designed smooth accessible tanks which enable easy and safe filling, emptying and cleaning even in the most awkward locations. WHAT HAPPENS IF I FILL THE TANKS WITH HOT/BOILING WATER? Considering that the E36 walk behind scrubber-dryer thanks are made of plastic, Eureka S.p.A kindly suggests operators not to use hot/boiling water. HOW IS THE SQUEEGEE SET-UP ON THE E36 SCRUBBER-DRYER? Inclination: when the whole squeegee runs on the surface with the same pressure. 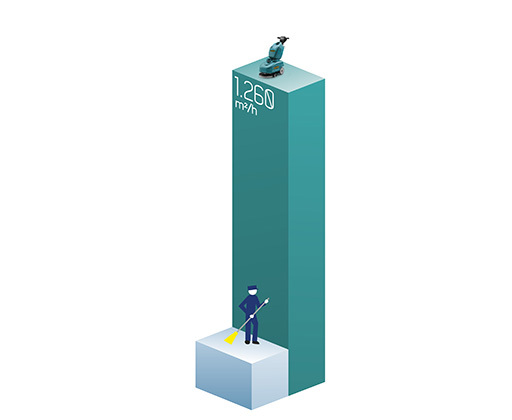 Pressure: the possibility to adjust the squeegee pressure according to the required setting. Both systems have been designed in order to ensure the greatest water pick-up and to avoid any leakage of solution. 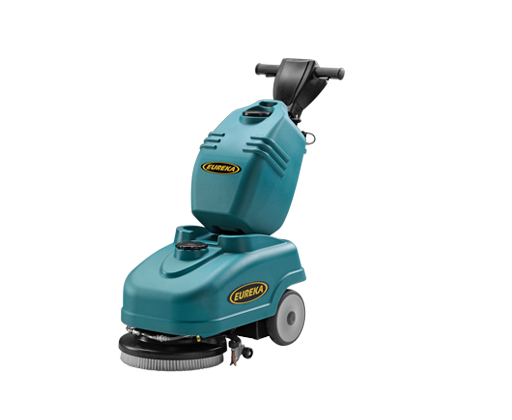 The E36 model has a cleaning width of 360 mm which, combined with a 3,7 km/h speed, boasts a cleaning capacity of 1.332 m2/h. The E36 is available either driven by a 12 volt sealed battery, which allows for up to an impressive 1 hour and 40 minutes of continuous operation, or cord powered, for unlimited running time. The machine can be easily folded for storage and for easy transportation. 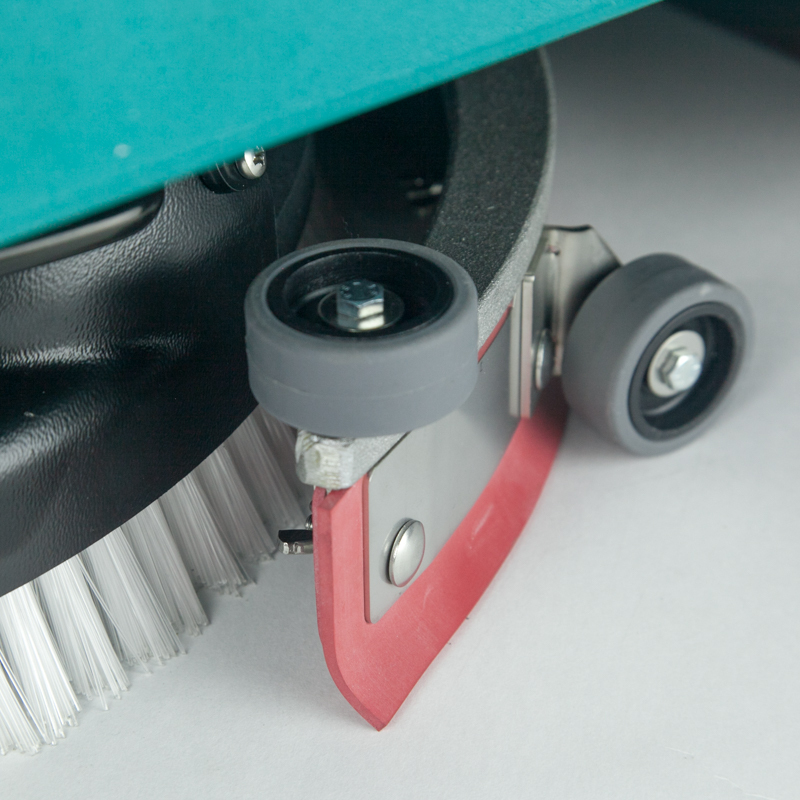 The brush, or the abrasive pad, can be rapidly replaced without the need for tools. The water hose and the vacuum hose are incorporated within the handle bar, for better protection, easier maintenance, and easier detachment of recovery tank. For safety reasons, the E36 can be switched on and off with a convenient key. The handle bar can be adjusted to height for better operator comfort. The controls are fully visible and very intuitive. Ergonomic handles and grips eliminate weariness and boost operator comfort. Powerfully scrub around obstacles with the E36 highly maneuverable handle. 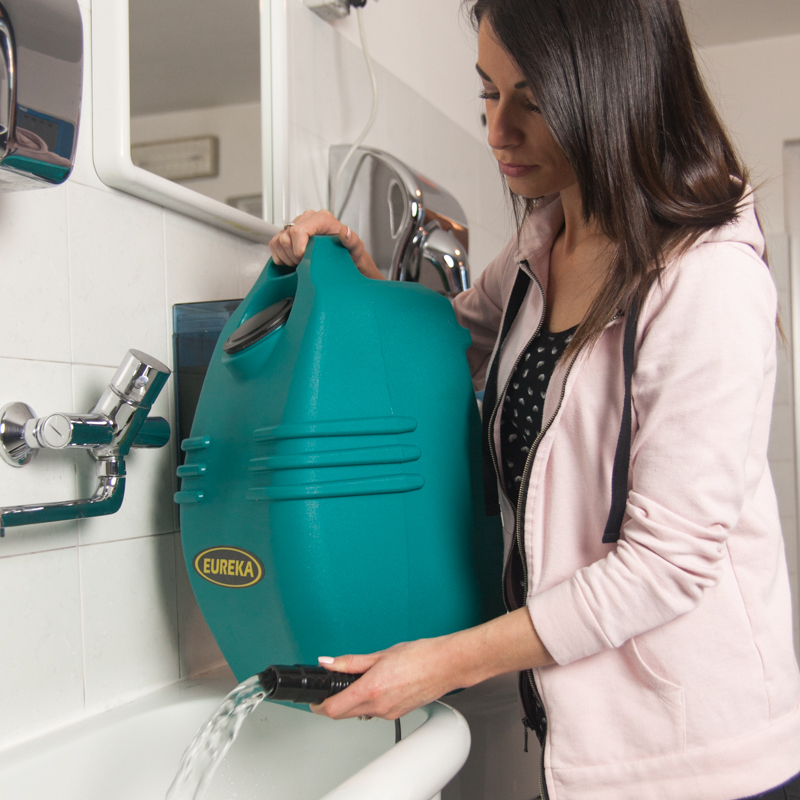 Cut down the danger of slip-and-fall accidents with excellent water pick up, leaving floors clean and dry. Fully removable tanks enable incredibly easy filling, emptying and cleaning, even in the most awkward locations. The machine can be easily folded for simple transportation and storage.